Four Star Solar's pre-wired and tested Magnum MS4024PAE/2 Dual Inverter Power Center comes equipped with two Magnum Energy MS4024PAE 120/240 sinewave Inverters and a choice of charge controllers to give you 8,000 watts of power. Mounted on a Magnum MBP-D double back plate, its sophisticated ME-RTR router organizes your connections and allows you to access information on each inverter individually. A Magnum Energy BMK battery monitor is also included in this package, so you can keep an eye on your batteries' performance. The dual Magnum power center is 32" wide and 40" tall with one or no charge controllers. If two charge controllers are installed the height increases to about 51" due to conduit and this unit is 9" deep from wall. Since this system has already been assembled and tested, you will significantly save on time and/or labor costs it takes to put a system like this together. The cost of the components, when bought in a package, is also significantly lower. 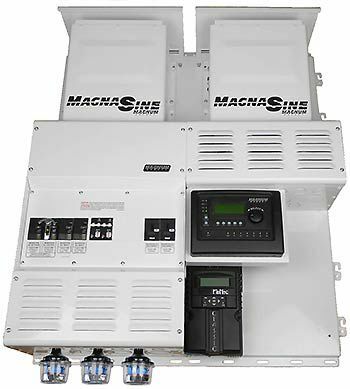 And because the MS Series inverters in this system are installed with a Magnum Energy panel and mounting plate, they carry a five-year warranty, rather than the standard three-year warranty. This package comes with or without charge controllers. You can choose to have either one or two FLEXmax 80 or MidNite Solar Classic 150 Charge Controllers. Feel free to click on the components below to learn more about this system. You can also contact one of our sale technicians at 1-800-472-1142 or email us at [email protected].